As floodwaters drained in the weeks following Hurricane Katrina, New Orleans residents came to a difficult realization. Their city was about to undertake the largest disaster recovery in American history, yet they faced a profound leadership vacuum: members of every tier of government, from the municipal to the federal level, had fallen down on the job. We Shall Not Be Moved tells the absorbing story of the community leaders who stepped into this void to rebuild the city they loved. From a Vietnamese Catholic priest who immediately knows when two of his six thousand parishioners go missing to a single mother from the Lower Ninth Ward who instructs the likes of Jimmy Carter and Brad Pitt, these intrepid local organizers show that a city’s fate rests on the backs of its citizens. On their watch, New Orleans neighborhoods become small governments. These leaders organize their neighbors to ward off demolition threats, write comprehensive recovery plans, found community schools, open volunteer centers, raise funds to rebuild fire stations and libraries, and convince tens of thousands of skeptical residents to return home. 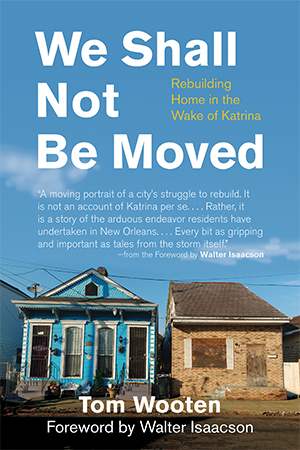 Focusing on recovery efforts in five New Orleans neighborhoods—Broadmoor, Hollygrove, Lakeview, the Lower Ninth Ward, and Village de l’Est—Tom Wooten presents vivid narratives through the eyes and voices of residents rebuilding their homes, telling a story of resilience as entertaining as it is instructive. The unprecedented community mobilization underway in New Orleans is a silver lining of Hurricane Katrina’s legacy. By shedding light on this rebirth, We Shall Not Be Moved shows how residents, remarkably, turned a profound national failure into a story of hope. It was late afternoon on Sunday, August 29, 2005. Terry Miranda, a white man in his late fifties, craned his neck to peer out the rear windshield as the storm that had sent his city into exile churned on the horizon over the Gulf of Mexico. The storm’s first fast-moving outer bands had already set upon the westbound traffic that inched forward on Interstate 10, turning the sky above the cars every hue of gray. Leveling his gaze to the horizon, back toward his home, Terry was struck to see that the distant sky was nearly black. Katrina was casting a dark, slowly advancing shadow across the earth. Bolts of lightning—far too distant to be accompanied by claps of thunder—leapt through the darkness to the ground. The storm posed the cars on this stretch of highway no serious danger. It would be hours before the worst of its winds and waves would surge ashore, and the traffic was already well to the west of the area forecast to bear the brunt of the damage. Still, a shudder ran through Terry’s spine as he turned his attention away from the dark sky. 9:30 a.m., Mayor Ray Nagin had ordered the first mandatory evacuation in New Orleans history. Shortly thereafter, the normally stoic National Weather Service released an uncharacteristically desperate bulletin, warning of “devastating damage” that would leave “at least one half of well-constructed homes” destroyed. Those lucky enough to survive, it warned, would experience “human suffering incredible by modern standards” in its aftermath. Before the mandatory call to evacuate that Sunday morning, Terry was not sure he was going to leave. For one thing, he had weathered a number of hurricanes at home and was no worse for wear. For another, he did not own a car, never having lived outside of Orleans Parish. He walked to the nearby shops in his neighborhood, a predominantly white and upper-middle-class area of the city known as Lakeview, and until his retirement several years before, he had ridden his bicycle to and from his job investigating cases of fraud at a state food stamp office. Like all state employees, Terry was pressed into service from time to time as a worker for the Red Cross. Because of his Red Cross experience, Terry would later explain, “When the mayor declared a mandatory evacuation, I knew what a desperate move that was.” He did not object when his sister insisted on picking him up. Terry hoped he would not be away long; he had never moved from New Orleans because he loved the city. Of course, New Orleans contained his entire life: his family, his friends, his house, his possessions, and his memories. But Terry was also in love with the idea of New Orleans; he was a true student of the city. He knew all of its neighborhoods after years of traversing the city by bicycle, and he lapped up its history through books, visits to historical societies, and conversations with old friends on the street. After retiring from the food stamp office, he made several abortive attempts to begin a bicycle tour company, but Terry’s entrepreneurial drive did not match his enthusiasm for “narrating New Orleans” to anyone who would listen. More often than not, he gave his tours for free. Terry thrived in New Orleans, and he was far from solitary. His four siblings also lived in the city, and they would all frequently converge at their mother’s house in the Irish Channel for a meal or a relaxing afternoon together. Terry’s neighborhood, Lakeview, also embraced him. Many in the community came to know him through his work for the Lakeview Civic Improvement Association—work that won him widespread affection, gratitude, and respect. “I was kind of their manual labor. I didn’t want to be on any boards,” he said. He spent countless hours cleaning the neighborhood’s wide “neutral grounds”—narrow strips of parkland separating opposing traffic on major roads. He would wake up before dawn to set up tents for the annual Lakeview Fest, staying up to strike the tents the same night. He usually begged out of attending the Lakeview Civic Improvement Association’s community meetings, with the exception of one the year before at which he had been presented with the association’s citizenship award. Lakeview encompassed a large area, with approximately 7,000 homes and 17,000 residents, but it was a cohesive community in spite of its size. Much of the neighborhood consisted of 1950s housing, bungalows built on recently drained swampland. Young families purchased new homes under the GI Bill and never left. Decades later, many children who had grown up in Lakeview during the neighborhood’s first boom bought houses down the street from their parents and began families of their own. As the years went on, many in the neighborhood would come to marvel at the strength of their community, likening it to Mayberry, the fictional idyllic town in The Andy Griffith Show. “People settled in Lakeview,” Terry said. The neighborhood’s geographic isolation helped it maintain its community cohesion; it was bounded to the south by expansive cemeteries, to the north by Lake Pontchartrain, to the east by a canal and City Park, and to the west by a canal and the Orleans Parish line. It was an island, cordoned off from the outside world. These confines allowed Lakeview’s residents to nurture a suburban utopia inside of— and yet apart from—the city of New Orleans. Community meetings in Lakeview were serious business. The Lakeview Civic Improvement Association—“LCIA,” as everyone called it—was the oldest incorporated civic group in Louisiana. Over the years it had come to serve as the neighborhood’s de facto government, tasked with helping Lakeview’s residents maintain their suburban standard of living in a poor, corrupt, crime-ridden city. Lakeview constituted a substantial portion of the city’s residential tax base, and residents were perpetually frustrated that their tax dollars never returned to the neighborhood in the form of adequate city services. Though the neighborhood’s houses were well kept and its lawns immaculately manicured, its streets were pothole-ridden, its sidewalks were cracked, and its sewer system was in perpetual disrepair. Most of its children attended parochial schools, as residents tended to distrust the city’s public school system. Historically, many had also complained about inadequate police protection. Residents’ frustration came to a head in early 1980s, when the LCIA mounted a push for Lakeview to secede from Orleans Parish and form its own city. The proposal made some progress in the state legislature, but ultimately proved futile when the City of New Orleans, reluctant to let one of its cash cows slip away, refused to sign off on the deal. Instead, Lakeview became the first neighborhood in the state to form its own special tax district. From then on, Lakeview residents paid additional property taxes to support the neighborhood’s own police force. Officers were members of the New Orleans Police Department, but patrolled only Lakeview, using equipment and squad cars the neighborhood had purchased. Now, as Terry sat next to his sister, lulled by the stop-and-go of the traffic on Interstate 10, the thought of Lakeview’s special police force gave him comfort. There had been speculation about looting, but the looters would not come to Lakeview, and they would be caught if they did. His house was safe.